Now that the sun has finally decided to make an appearance, it’s time to give careful consideration to your summer colour vibe. The SS15 catwalks were awash with a plethora of beautiful hues to tempt you away from your wardrobe crammed full of normcore grey, which was all the rage for the autumn and winter months. 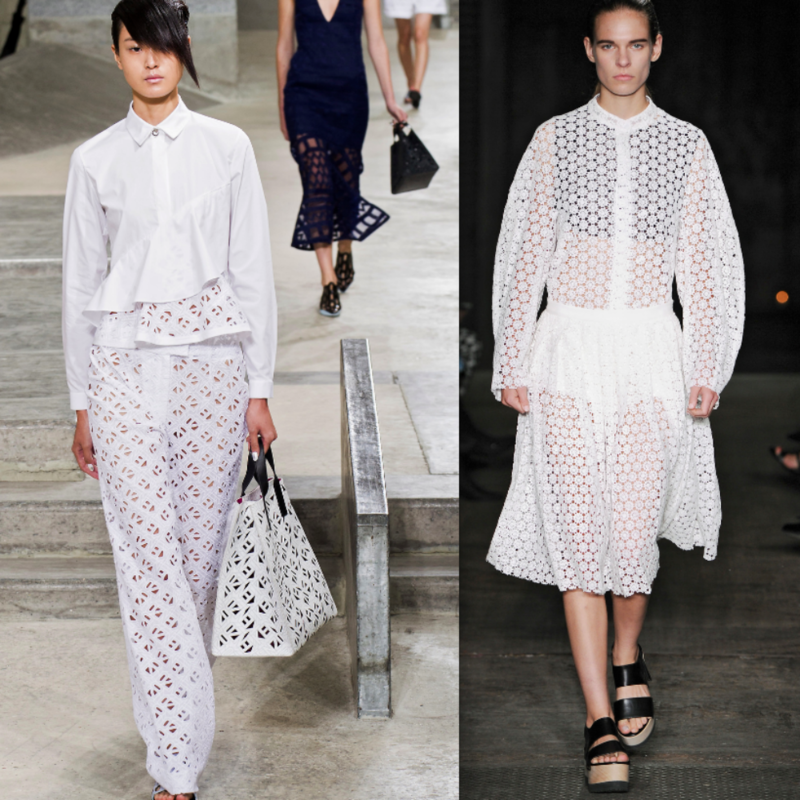 The key to wearing this season’s freshest shade as seen here at Kenzo (L) and Joseph (R) is all in the detail and what counts is the craftsmanship: fine lace, delicate cutwork and broderie anglaise elevate these designs from pretty basics to infinitely precious pieces. 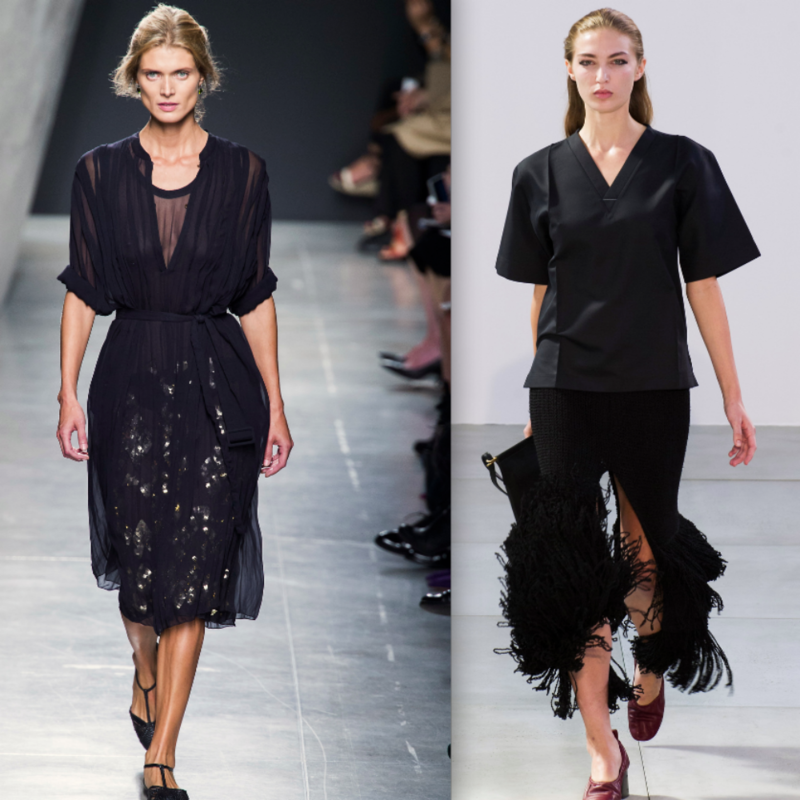 Chloé, Valentino, Erdem and Louis Vuitton all sent out looks worthy of any special occasion. This attention to detail need not break the bank either: we love these high-street options from Zara, Whistles and Next. Brights do all the talking in the outfit stakes where colour is concerned, so wallflowers need not apply! 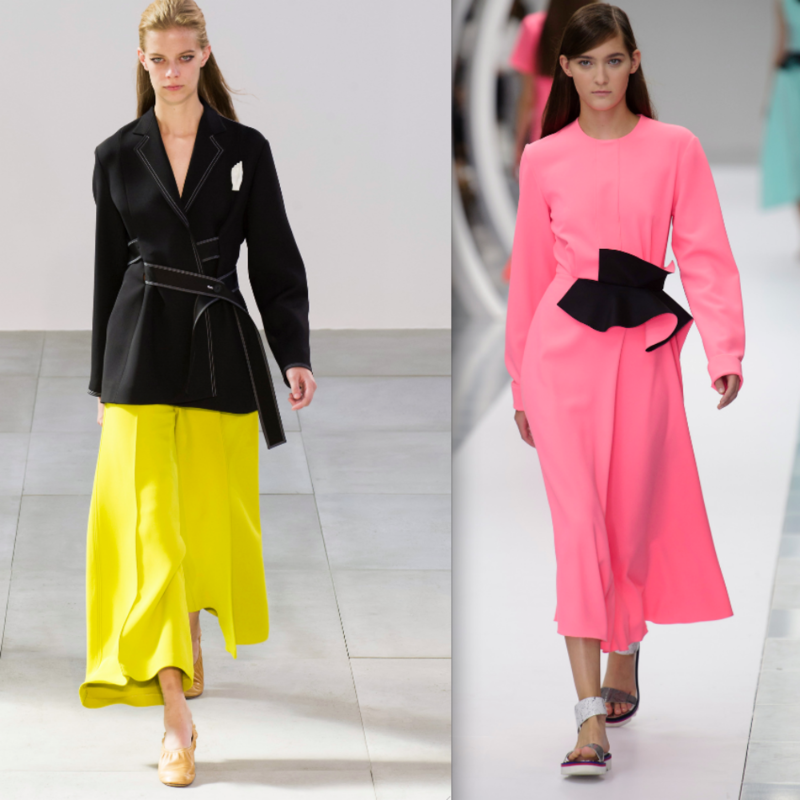 The chicest way to put a SS15 spin on it, is to pair your standout pop of colour with black for an ultra-graphic, modern feel – best demonstrated in these enviable show stoppers from Céline (L) and Roksanda (R). Shop here for brights we like at Topshop, Bimba & Lola and Net-A-Porter. 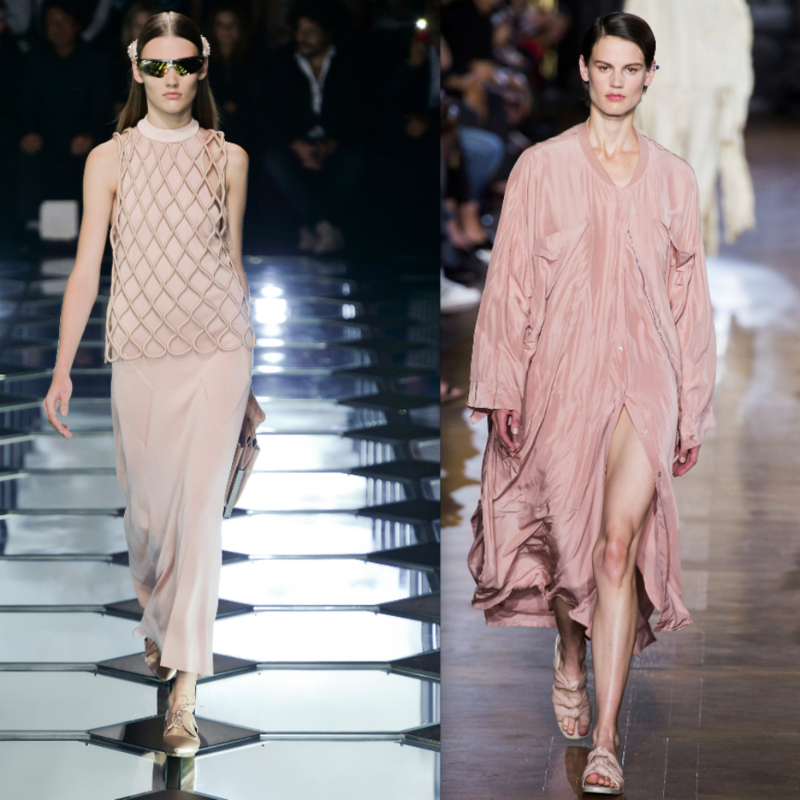 This subtle shade comes into its own worn in a relaxed sports way à la Balenciaga (L) & Stella McCartney (R). Channel your inner track star in parachute silks and mesh detailing to nail this look. Take a look at these options from Matches, Dune and Filippa K.
Girly and feminine pastels never fail to make an appearance on the spring catwalks and this season they were in abundance once again. We love this fresh take on the trend, mixing a multitude of pastels into one look, as seen at Burberry (L) and Valentino (R). Find your sorbet selection at these stores M&S, ASOS and Avenue 32. There is something to be said for summer black in that it will always look chic and smart and is a fail-safe that will never let you down or make you look/feel dated. The trick this time round is to look for pieces that have a texture that adds a bit of interest (check out Bottega Veneta (L) and Céline (R) for inspo) and extra va-va-voom to what otherwise could be deemed as the boring option. Options in store now: Net-A-Porter , Selfridges and Browns.